← What is a Blood Moon? For the first time, astronomers are able to make weather predictions on distant planets orbiting stars other than our own Sun. For two worlds whose atmospheres scientists have been studying, the forecast is overcast, with a chance of additional cloud. The planets, GJ 436b, and GJ 1214b, are 36 light years away in the constellation Leo, and 40 light years away in the constellation Ophiuchis, respectively.When astronomers split starlight into its component colours, they can identify the characteristic signatures of different elements and compounds to record what the star is made from. A very similar technique is often used to identify the composition of clouds of gas in the space between a star and the Earth. By comparing the expected spectrum with the one actually observed, astronomers are able to spot the missing colours and deduce what types of gas the light is passing through. In the case of the two exoplanets, the gas being studied was their atmospheres. One method by which exoplanets are discovered is the transit method. If a planet’s orbit is aligned between the Earth and its star, it will appear to eclipse that star at regular intervals. When that happens, we can detect and measure the faint dip in the star’s brightness, and this reveals the size of the planet and the speed of its orbit. But if our instruments are sensitive enough, we can also detect the very slight changes in the star’s spectrum caused by the tiny amounts of light which are not blocked by the planet but are instead filtered through its atmosphere. This technique is quite new, though, and instruments sensitive enough to make it possible have only recently become available. GJ 436b is classed as a “Warm Neptune”, because it is a relatively small gas giant planet about the size of Neptune, and orbits so close to its parent star that its average atmospheric temperature is measured in hundreds of degrees. When its atmosphere was examined by Heather Knutson of the California Institute of Technology in Pasadena, California and her team through the Hubble Space Telescope, they were surprised to find its spectrum was completely flat, revealing no information at all about its composition. “Either this planet has a high cloud layer obscuring the view, or it has a cloud-free atmosphere that is deficient in hydrogen, which would make it very unlike Neptune,” said Knutson. “Instead of hydrogen, it could have relatively large amounts of heavier molecules such as water vapor, carbon monoxide, and carbon dioxide, which would compress the atmosphere and make it hard for us to detect any chemical signatures.” This scenario seems unlikely, but is not impossible. Earlier research studying GJ 1214b had noticed something similar. GJ 1214b is a little smaller, being classed as a “Super Earth” which means that it is a rocky planet, but several times larger than Earth. It too orbits very close to its star, and is very hot. Its spectrum was also featureless, indicating either heavy layers of high-level cloud, or an atmosphere composed almost entirely of heavy compounds like water. But then Laura Kreidberg and Jacob Bean of the University of Chicago used the Hubble to look more closely at GJ 1214b, and were able to show which of those two options were true. It might seem from what you have read so far that heavier compounds do not show up in a spectrogram, but in fact their chemical fingerprints are simply far more subtle. Sufficiently sensitive readings do detect them, and that is what Kreidberg and Bean’s team hoped to find by devoting more observing time with the Hubble than had ever been spent on an exoplanet. The result of their work was another featureless spectrum, showing that the light was simply being blocked altogether by high-altitude clouds. We now know that these worlds are very cloudy, but we can be prety sure that these clouds are not formed from water vapour as on Earth. 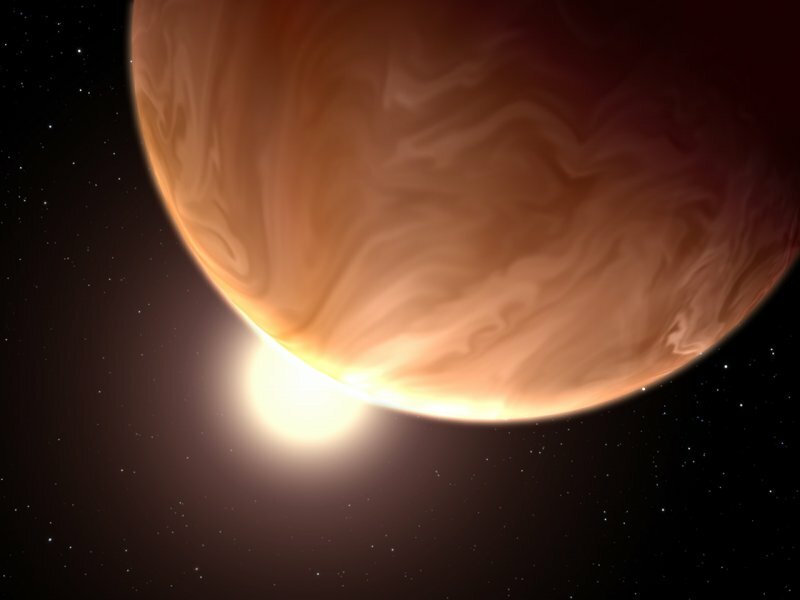 Models of GJ 436b and GJ 1214b predict clouds that could be made out of potassium chloride or zinc sulfide at the scorching temperatures of several hundred degrees Fahrenheit predicted to be found in these atmospheres. “You would expect very different kinds of clouds to form on these planets than you would find, say, on Earth,” said Kreidberg. The work by Kreidbeg et al can be read in this paper.